Canada’s Tessa Virtue and Scott Moir perform their free dance at the 2016-17 ISU Grand Prix Final. Canada’s Tessa Virtue and Scott Moir (197.22) defeated France’s Gabriella Papadakis and Guillaume Cizeron (192.81) for the second time this year to win the first Grand Prix Final title of their illustrious career with the new world record. USA’s Maia Shibutani and Alex Shibutani won the bronze (189.60). The Canadians had to overcome a minor setback when their music had to be restarted. “I just did not want to start yet,” joked Moir at the press conference when asked about the problem. “It’s difficult for us as we start facing not each other, but the other way,” added Moir. After the second start, their “Pilgrims on a Long Journey” and “Latch” free dance unfolded smoothly and flawlessly, ending up the same way it started with a low rotational lift. The team earned excellent grades of execution on all elements and picked up nine perfect 10.0 scores in the program component scores, most of them for performance and timing/interpretation. The team, who has won every major title except for the Grand Prix Final, was also happy to settle that score. Papadakis and Cizeron’s free dance to “Stillness,” “Oddudua” and “Happiness does not Wait” was equally impressive and fluid with seamlessly incorporated lifts. Their opening straightline lift was particularly impressive as it matched the rhythm of their music and received +3 as a grade of execution across the board. While the team picked up seven perfect 10.0 program component scores, their twizzle sequence was graded a level three. Shibutani and Shibutani also delivered a strong performance to “Mirror In Mirror,” but the students of Marina Zueva only received level two for their diagonal step sequence. Russia’s Ekaterina Bobrova and Dmitri Soloviev finished fourth with 181.95 points. The students of Alexander Zhulin received level three for their rotational lift and were very upset about this fact. USA’s Madison Hubbell and Zachary Donohue edged out teammates Madison Chock and Evan Bates for the fifth place finish. 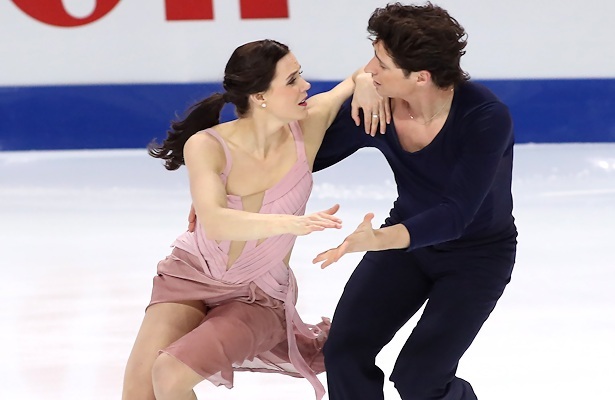 Chock and Bates improved on their poor performance in the short dance and skated the most upbeat free dance of the night to “Under Pressure” by David Bowie and Freddie Mercury to finish fourth in the free. However, their low score from the short kept them in last place.